and a collaboration with Jacek Zuzanski of DreamTales Puppets , a wonderful puppeteer and director -- I'll make the voices for Jack, the Giant, Giant's wife and other silly characters in "Jack and the Beanstalk" at the Boylston Public Library on July 27th at 11:30 am. Chairs? 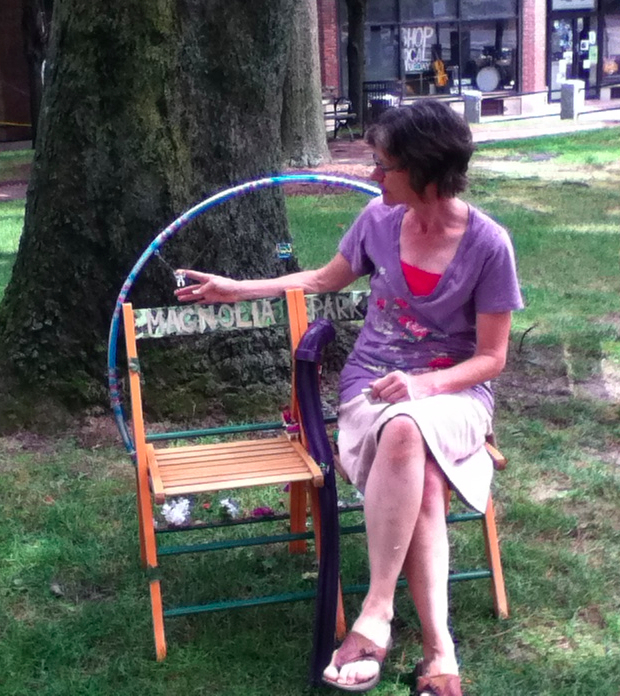 Come see "Chairful Where You Sit," Arlington's public art exhibit. My daughter Frances and her friends and I made a "Magnolia Park Bench" complete with swings, a slide, a community garden, and worried parents. Come see our bench at Mass. Ave and Pleasant St., from July 21 to 28!